The .50 Cal is a large-caliber machine gun. 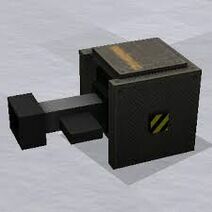 It can be very useful with multiple R.O.F mod, also with some Detector mods. Not very good after higher levels due to more powerful enemies, but it's recommended that you use it before level 10. It shares the same body as a machine gun and has a single long barrel instead of two short ones. It has what appears to be a magazine on its left side. Its barrel looks to be much larger than .50 Caliber. Block Fortress Wiki is a FANDOM Games Community.